When we talk about blogging one thing that will come first in our thoughts is WordPress, it has the hold as best Content Management System title undisputedly. It manages the optimization for websites as its SEO optimized. with 100's of plugins. Organic Search engines like Google, Yahoo etc. gives more traffic to Wordpress as it has the potential of becoming SEO friendly by correctly configuring it, It has such vast support for Third party plugins like Yoast, jetpack, All in one SEO etc. Hence so it manages the contents for blogs very well, but we know it’s the content at last which matters. Content is the King, so we must give priority to the content of the blog we dealing with. There is a problem of content duplicity which kills the quality of your website, and hence, here in this article, we will discuss how to deal with this problem. So get ready for a drive for our smooth ride with our blog to win the race against duplicity. Generally, duplicate content can be defined as content which could be accessed by multiple URLs of websites or blogs, which spoils content efficiency. Due to this the visitor are not able to get quality content. Added on the pages with little to no content are also considered to be duplicate content. Duplicate content makes less or no value for your visitors and puzzles search engines. SEO performance is harmed by the presence of it. Duplicate content decreases the ranking and performance of the website or blog during the search. It can be caused by technical mishaps and manually copied content. Blogs with duplicate content can be penalized by Google. Yes, you heard it right Manual Actions From Google. What actually is a Manual Action? According To Google when a Human Reviewer at Google reviewed a blog/site and they found the site doesn't compliant with Google's webmaster quality guidelines and it is just trying to trick the search engines to manipulate the search Index. What happened when Manual Action strikes on our blog? The first thing you will not be knowing whether your blog is stricken by Manual Action. because Google told in this article they can lower your blog ranking without notifying or indicating user. How To Know Whether the Blog is Penalized? 1. You can get the notification if you register your blog in Google Webmaster Tools. In the Manual Action Section, you will find whether your blog is hit by a manual action or not. 2. The sudden drop in organic traffic can also be the cause of Manual Action. Register your site in Google Analytics then weekly check how much is your traffic? Check for a sudden drop in traffic. Which Manual Action is for Duplicate Content? Google Have classified Manual Actions based on the user actions to manipulate search engine to achieve their desires. Google has more than 10 types of Manual Actions but for the duplicate content which contains no weight. it has Thin content with little or no added value Manual Action. The Scraped content can be defined as content which is not original on a site and has been copied. These can be copied from some another website without permission of the owner of the website. Google may be sometimes not abler to tell difference between both of the original and the copy, so it's often the site owner's task to be on the lookout for scrapers. As we know it adds no benefit to the ranking. The content owner must know; what to do if their content gets stolen. Syndicated content or syndication of the content is when it gets republished on some other third party website, but with the permission of the original piece's author. Well as we know it’s a legal way to get your content in front of the new viewer to increase the audience base. It's important to set some set of rules so that the third party publisher who is working with to make sure syndication doesn't turn out be a problematic issue for the website. With the use of canonical tags, you can authenticate the originality of content. This is a problem that occurs commonly when internal duplication problems are identical HTTP and HTTPS URLs on a site. These issues arise when the switch to HTTPS isn't implemented with the thorough attention the process requires. This can happen if there are backlinks from other sites directing to HTTP pages, It happens because some internal links on your site still contain the old protocol, and the non-secure pages do not redirect visitors to the secure ones. Most often completely identical content are thought of as duplicate content. But a chunk of very similar content also comes under it. Mostly when we write some kind of same stuff those are kind of identical like travelling same place etc. So we can merge those to eradicate this problem. On blogs, similar content disputes may arise while updating the old content. In this situation, using a canonical link on the older article is the best solution. It happens as your site's pages have printer-friendly versions accessible which is accessed via separate URLs, it will be easy for Google to find and crawl those through internal links. As content on the page itself and its version which is printer friendly are going to be identical. So now, this question might be in your head, how Google identify duplicate content. The answer is Crawlers. In simple Crawlers is a set of instruction which is programmed to visit various sites over the internet. So, websites or specific pages can be selectively visited and indexed. Crawlers often called as spiderbots, got the name because it crawls through a site a page at a time. In this way the crawler bots search your site, they will recognize the duplicacy of the site and so, it is indeed duplicate content. 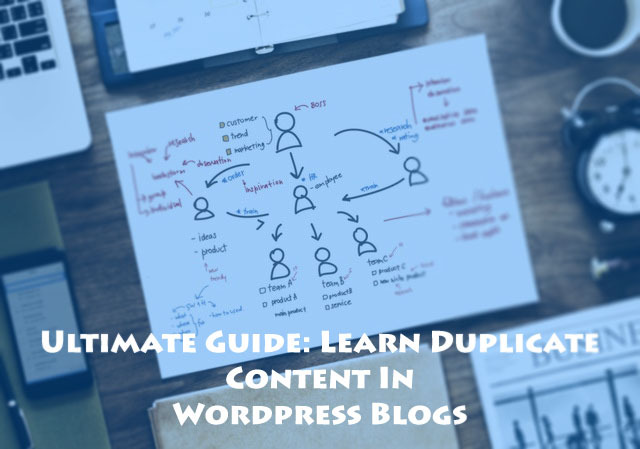 In this article, we learned about Duplicate Content in WordPress, Manual Action on Duplicate Content by Google and How Search Engines find duplicate content. In the next article, I will explain you step by step how to fix the duplicate content issues. Hope all of you learned something useful from this tutorial. Please share this article on your social pages.